As we look back at the real estate boom, it’s clear that many of us got used to the idea of quick home price appreciation. Real estate speculation became a game not just for investors, but for anyone with some equity and the desire to move. 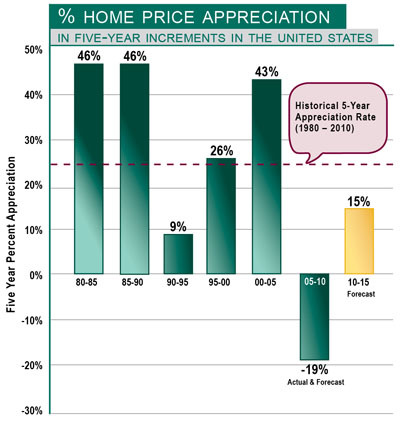 As we become accustomed to the post-boom market, our expectations for home price appreciation need to evolve as well. From 1980 through 2010 (including six months forecasted for this year), home values appreciated on average 25% every five years. This average appreciation rate incorporates the post recession boom of the late 80s, the housing downturn of the early 90s, and the more recent boom and financial crisis of the past decade. The years since 2000 have been anything but normal. As a nation, we experienced extremely high real estate appreciation rates between 2002 and 2007, which were followed by historic price declines over the past three years. Though these appreciation and depreciation rates vary depending on area and price range, what seems to be true for all price points and regions is that homes are once again places of shelter—not get-rich-quick investments. From this point forward, most homeowners will want to stay in their homes for three to five years to build up enough equity to make selling and moving a sound financial decision. This is because most major real estate economists anticipate that we will not see moderate appreciation in home value appreciation until 2011 and very gradual year-over-year improvement into the next decade. The multi-year recoup period is historically normal: annual appreciation rates averaged 4.6 percent (compounded) per year since 1980, despite the many ups and downs over the past 30 years. Since they will most likely want to stay in their next home for at least three to five years, today’s buyers need to consider their near-and long-term plans as they shop. Growing families, retirement, children going off to college, or any other factor that could affect their budget or the amount of space they’ll need over the next several years should be taken into account. Many homeowners and would-be buyers are wondering if it is a good time to sell or buy. We have seen valuations stabilizing in many areas and price points, and since current historically low interest rates equal greater purchasing power, sellers and buyers need to consider their individual situations carefully. As normal appreciation rates return and become more familiar, we must realize that while real estate is still a good long-term investment, a home is about far more than money—there are many personal riches that come with owning a home, including those that fuel a healthier family and community.